Before you can start looking for holiday home or a permanent residence, it’s important to narrow down the criteria when choosing the right area of France – or a selection of best areas. France is a big place, after all. For a growing range of fact-files and articles about the regions and départements of France from a property-buyers perspective see our regional guides. What is important to you, in deciding where you might live, or where you will be spending your holidays? Weather comes high up many people’s lists as a factor in choosing the right area. France is a big country with many climatic influences so it is hard to generalise but there are a few basic guidelines and resources which can help you. Many people choose to buy within a few hours drive of the Channel ports. This area, North Western France, has generally similar weather to Southern England, not surprisingly perhaps, as it was once connected by land! As you move South the further inland you go the hotter it will be in summer and the colder in winter. So if your previous experience is of fantastic hot summer holidays in an inland region you can probably expect a large bill for logs in the winter! If your budget will stretch to it you may be tempted to buy in Provence or the Languedoc, Mediterranean regions with the warmest climates in France. But you should bear in mind that living and working in a hot climate can be far different from holidaying in the sun, and even these attractive regions have their own climatic micro-climates to contend with. The cold Mistral wind blows down from the mountains through Provence and can spoil anyone’s mood when it gets going. Global warming is thought to cause problems in some areas, notably the Languedoc where there have been a number of devastating flash-floods in recent years causing loss of life and enormous damage to some towns and villages. In spite of this the area is extremely popular with British, Dutch, Scandinavians and many French people from the North of France. The French often say that they have reached the warmth of the South as they cross the Loire, the grand river that crosses over half of France. 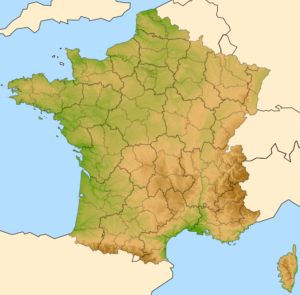 South of this divide the Charente) and Charente Maritime departments in Western France claim the highest sunshine hours after the Cote d’Azur. But further South does not necessarily mean more sunshine and less rain. Areas close to the Western side of the Pyrenees are very attractive but also receive quite dramatic amounts of rainfall in autumn and winter. In summary although climate is an important factor it is worth asking yourself what times of the year you plan to visit or, if making a permanent move, how you will be spending your time in France as these can have quite a bearing on whether climate is such an important factor. Meteo France has access to weather statistics. How easy is it to get to your chosen area? It’s obviously less important if you are living in France full time, but even then you may need to return to England for family or work reasons and family and friends will certainly be planning to visit you! Northern regions like Brittany and Normandy have obvious attractions with their easy driving to the Ferry ports, while some people even live in the Calais area and commute to England. Travelling for a whole day to places further afield is likely to rule out a quick weekend trip. However, cheap flights have done wonders for those with homes in central and southern parts of France. With five airports in the vicinity, the Poitou-Charentes area is becoming deservedly popular with foreign buyers. You will want to take advantage of flights from British Airways, Air France and EasyJet to major cities like Toulouse, Nice, Bordeaux as well as from Ryanair and FlyBe which have opened up affordable access to newer destinations like Carcassonne, Bergerac, Pau, Montpellier, Nantes and Clermont-Ferrand. However, you should be cautious if your chosen area is heavily reliant on one budget airline and airport to get you and friends and family back and forth. Routes are liable to close as quickly as they open. See our Travel & Transport Zone for more information. On the other hand, if you plan to buy a house to restore you may wish to consider the possibility of taking building materials and equipment with you unless you intend to buy everything in France. You will most likely need transport when in France, which needs to be considered when flying. And all the wine and French products you will want to take back can easily add up to excess baggage – these are just some of the many things to consider. And town or country? Both have their advantages – easy access to shops and services, or peace and quiet? Inland areas of France – the Limousin, Ardèche ) and Burgundy regions being good examples, have been rather neglected by foreign buyers and so offer good value at present, though as their popularity increases the bargains are getting harder to find. The Dordogne region has traditionally been popular with English buyers – and remains so, offering a combination of climate, scenery, reasonable access and the reassurance of an English-speaking community being close at hand. Provence, although further south and less easily accessible, is another very popular area for foreigners thanks to a great extent to the Peter Mayle factor – the idyllic lifestyle highlighted by the books and TV programmes, though reality can often be different. Languedoc is a current hot spot, with high prices to reflect this, thanks in the main to its development area status which is bringing considerable prosperity to a once-neglected area – however this may not suit those looking for quiet and isolation, though plenty of places remain unspoilt. Being close to a big city has its advantages. Shopping and public transport are far better than in rural areas, there will be a multiplicity of entertainments, restaurants etc. But cities usually also mean a faster pace of life, more modern, more materialistic attitudes, and higher crime levels – the things that many would-be expats or holiday home buyers want to avoid. Perhaps the ideal is to be within striking distance of a good-sized town or city for those occasional forays to DIY and furniture stores or just to take in a bit of French city culture. Everyone professes to want to escape their over-stressed over-financed over-crowded homeland and settle in as quickly as possible to some kind of idyllic French rural life. The last thing they expect to see is another family of newbie expats settling in next door! But this is beginning to happen in many areas now. There are schools in the Languedoc with more English-speaking children than French. There are colonies of villages populated and virtually run by Dutch expats and of course there are parts of the Dordogne where you hear more English than French spoken on market days. It’s a largely under-reported phenomenon, a true European migration of our times. Unless you are deliberately heading right off the beaten track you will come across this trend as you get to know your chosen area of France. Does this mean you should choose your area with this factor in mind? That depends very much on your attitude to having other non-French in the neighbourhood. Although it may slightly tarnish the rosy dream of being the unique and “special” arrivals in the midst of your otherwise pure French village there are nevertheless many advantages to living somewhere with other expats nearby. French country people are generally friendly and generous and there are many heart-warming stories of the old-fashioned home-spun hospitality being offered to newcomers – even if you are the 37th British family in the commune! But the French are also a proud and private people and it can take many many years to really get to know people well and genuinely feel accepted as part of the community. Accepting this fact, it can be extremely helpful to have other expats nearby who can help you along the way with all the myriad questions, trials and challenges that you will have. Even if your French is pretty good, at the end of the day it’s still great to have some friends to talk to in order to share the latest experiences or just chat about about football, the soaps, the lack of good beer or what have you – as you sip a glass of the local vin rouge, of course. It’s stating the obvious but France is a big country with lots of open space and old houses. If you must live away from it all you will certainly be able to find your area. If you are less adventurous and don’t mind the idea that you won’t be the first non-French in your area then you will find that even the regions with a high percentage of expats still retain all the French charm and customs that we all enjoy and it is only at certain times of years or at market-days, brocante fairs and so on that you may notice other expats. Finally, contrary to some opinions, many French villagers are at the very least tolerant and often highly supportive of newcomers who bring children to help keep schools open, money to spend in shops and on local services and pay local taxes which help keep communes well-funded. For country dwellers, your surroundings play an important part in choosing an area. Remember that the landscape of France is on quite a different scale to the UK where we are used to scenery changing quite rapidly as you drive around. Tourists from all over the world marvel at the incredible diversity of landscape even within the counties of England. In France, by contrast, you will tend to find much more of the same type of landscape in any area and you may need to drive quite a few hours before your outlook changes. To begin a quick tour: you won’t get much more spectacular than the Pyrenees and Alpine areas, which have the additional attractions of being close to Spain and Italy/Switzerland respectively. The mountains and valleys of other areas like the Auvergne and Ardeche come close. Much of Normandy is similar to southern England, and the parallels between Brittany and Cornwall go further than the scenery. Many people find the Vendée and Western Loire flat and uninteresting though in compensation it has arguably one of the nicest climates of the whole of France and access to some lovely coastline. If you are heading South from the UK ferry ports down the West coast of France you will find the landscape quite flat or undulating until you reach the Southern Charente where the land changes to rolling hills as you near the Dordogne. To the east, areas like Alsace offer a different France; almost Germanic, and have a unique appeal. The landscapes of wine-growing areas in Burgundy, Bordeaux and Roussillon have a distinctive quality, low-lying often with rolling hills, green and attractive in spring and summer, rather barren in the winter. Remember that landscapes look very different in different seasons and all the best property photographs are taken with leafy trees, blue skies and the impression of endless summer. If landscape is important to you it’s a good idea to book yourself a winter break in the areas you are contemplating to see the landscape at its bleakest. How do you intend to spend your time when in France? This is particularly important if you want to rent out your holiday home as a gite when you aren’t there, or to supplement your income through running a gite complex or bed & breakfast accommodation. Proximity to beaches, leisure facilities, tourist attractions, etc. then becomes important. It’s surprising though how much there is to do in even the most unlikely areas and it’s worth doing some local research. Check out attractions in your chosen area, as well as looking at local tourist board sites. If you don’t know the area well take a look at other accommodation websites and see what they describe to do in the area. Do remember that much of France is very seasonal and villages heaving with tourists in July and August can become completely empty by the beginning of October so don’t base your expectations solely on previous summer holidays. And talking of how you spend your time – it may be tempting when you see how much land you can buy for your money to imagine yourself as an occasional smallholder or country squire, but several hectares can become an expensive liability if you are not there all the time to maintain it yourself. All very good if your plan is to live in France permanently, supporting yourself off the land, but if you are dreaming of a holiday home you will probably want to do other things on your all-too-brief visits beside cutting the grass. The price of housing is obviously a key factor for everyone. You can easily spend the same amount on a small apartment in Cannes as you would on a large country estate in the Mayenne. But think also about the cost of living. Although essentials like food and electricity cost much the same throughout France there can be wide variations in local taxation, some of which have been rising sharply in recent years. Ask the agents you are dealing with or the local Mairie for some idea of the taxes for your size of house in your target area. If you need regular access back home you will also need to do some comparative sums on your flight, train or petrol costs, otherwise that bargain remote property may cost you more than you thought. For older properties,the French national association of estate agents (FNAIM) produces an annual report with some very useful data about the relevant costs and price trends in the different regions of France. A trawl through any of the big property websites region by region will also soon give a flavour of what you can get for your money in the different parts of France. Just remember that although you will get more house and more land for your money nevertheless the same variables that you get at home apply – ie: property which looks unusually good value in comparison to other similar ones in the same area is usually priced that way for a reason. Could it be the TGV line to be built nearby one day soon, the new housing development (surprisingly common in rural France where French often prefer safe, sensible new-builds and sell the crumbling family farmhouse to the newcomers from abroad), the historical right of way across your drive for the local farmers, the proximity to a main road or just the unthinkable amount of money required to renovate it? You won’t see any of those factors mentioned as you surf the Internet looking at blue-sky images of dreamy French properties! When it comes to buying a holiday home or starting a whole new life hopefully the information on FrenchEntrée.com will be a useful resource and aide-memoire for anyone at this exciting stage of buying a house in France or planning a permanent move. 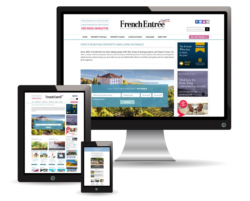 Read the best of FrenchEntrée each month by registering for our free French Property, Home & Life newsletter. Having just joined today, this is my first post and I’m not even sure if I’m on the right page? We are in the early stages of planning our move to France and I can’t wait till Friday to receive my latest FrenchEntree. We went to The France Show in January and are making plans to move in 2017. My question is does anyone find biting insects like midges and mosquitoes a problem? We are looking at Poitou-Charentes, Creuse and lower Brittany. Thanks. Just read your post about your move to France. Husband and I are both looking at moving soon but not sure what part. I see that you have visited a number of times to look at different areas. That is something that I mentioned to my hubby. We could take the motorhome to France and travel around for a couple of months to check out the different areas. I have looked at Dordogne region, but my husband would like to go further south. Have you got any advice, tips on what we should be looking at. I would like it to be warm most of the year, not to much rain.